Today, I took a very big step in my running adventures by registering for my first Ultramarathon. A "Ultra" short for Ultramarathon is any distance over 26.2 miles, a standard marathon. I've only really heard about ultra's in the last couple years either through friends talking about wanting to do one, or someone knowing someone who runs them. It all began over a few beers at Rivermill bar in Blacksburg, VA when I happened to run into some old high school friends. They were out partying hard before a fundraising run on campus the next day, one of whom was talking about his recent marathon and the "next" thing on his list, an ultra. This casual bar talk conversation planted the seed, but I really only began seriously considering registering and participating in this insane feat last week after my friend Jeff forwarded me a blog of an ultra runner he'd gone to college with. After reading through a few posts I was ready to sign up. Michelle had learned of and forwarded me a link for inaugural Giles County ultra marathon website and I was completely set on entering this run but it was not to be, as the run coincided with a friends wedding; the search continued. I researched friendly first ultra's and stumbled across a run series sponsored by The North Face, with one of the run's taking place in Sterling. It was meant to be. It didn't take more then a couple days to decide I was going to sign up, the only decision was which race I would participate in. Although an ultra is considered any distance more then 26.2 miles, a common step being 50K (31 Miles), most consider the first "real" ultra to be 50 miles. If I was going to register and attempt my first ultra, it would be a 50 miler (I figured I would complete a 50k in training for 50 miler anyways). 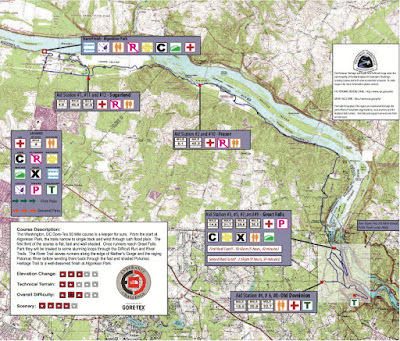 The map for The North Face Endurance Challenge 50 miler. I found a training plan that's sixteen weeks, the only hitch is that today was the start of week three and I can't really increase the load for another two weeks because I'm in a taper for the Yuengling Shamrock marathon on March 18th. I'm going to have to pick up the load after the marathon, which will give me about 10 weeks of solid training, peaking at 10 hours a week (between 40-55 miles a week). I hope to get back to blogging and using it to update both my progress training and updates with whats going on in life. There has to be something sick about a person who knowingly seeks out this type of physical punishment, to say the least, I'm pumped! Posted by Unknown at 7:07 PM , Links to this post , 0 comments I'm reading from MyDailyGround: Registered - The North Face Endurance Challenge - 50 Miler Tweet this!